It is now generally understood that economic inequality has expanded greatly since about 1970. (Well, there are exceptions. For a couple of decades, some commentators denied that economic inequality was growing, claiming that it was all a statistical illusion. A few holdouts against reality may remain.) Now the debate has shifted to what – if anything at all – should be done about inequality. Most of that discussion has been about income inequality. Between 1979 and 2007, the one-fifth of American households with the highest income experienced a roughly 100% increase in their annual, inflation-adjusted, after-tax income (280% [!] for the highest one percent of households); the middle one-fifth got about 25% more income; and the poorest one-fifth got about 15% more (see pdf). For wealth – property, stocks, and the like – the gap is enormously greater and has also widened over the last few decades (see Ch. 6 here). 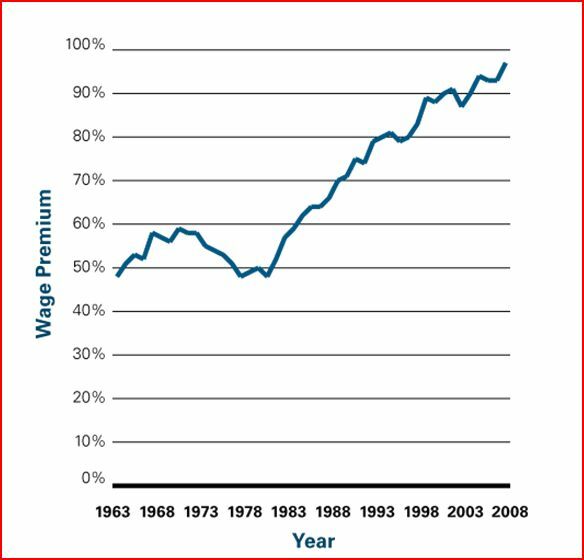 The chart below shows the trend in the “wage premium”: how much more workers with B.A.s make a week than workers with just a high school diploma make – after adjusting for earners’ races and work experiences. Except for a few years around 1970, the advantage grew, doubling between 1963 and 2008. College Board, "Education Pays 2010"
This education-income connection cycles back: Having more money means more education for the children. Affluent parents can buy homes in the best school districts or pay for private schools; they can purchase enrichment programs after school; and in the summer they can pay for SAT tutoring. College students from well-off families can focus on their classes and graduate on time while less fortunate ones cut classes to work and then drop out if the money for tuition gets tight. Going beyond the B.A. is also easier for children of affluence. This connection between family background and college graduation has not slackened in recent decades even as its consequences have become more fateful. In addition to making much more money, Americans increasingly benefit from college in other ways as well. Those with B.A.s are less likely to be unemployed. They are healthier; their children are more likely to be breast-fed and less likely to be obese. Differences such as these have widened. For example, in 1950, college grads and high school grads smoked at about the same rate; in 2008, those who had finished college were about 1/3 as likely to smoke as Americans who had only finished high school (see here). The college-educated have more stable family lives. They are likelier to eventually marry and, if they divorce, likelier to remarry than the less educated. And their children are, therefore, likelier to grow up with two parents in the home. 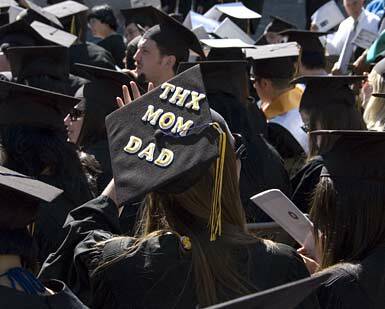 This family advantage for college graduates has grown wider over recent decades. The chart below shows the percentage of children fortunate enough to live with two adults from 1940 through 2000. 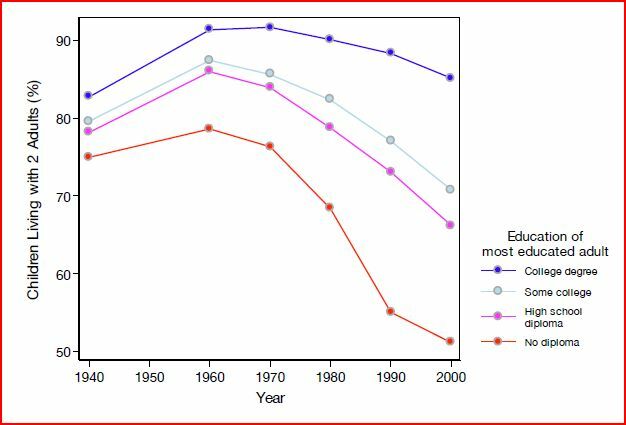 The different lines show the trends according to how much education the most educated adult in the home had attained. In 1940, the adult’s education made little difference in the chances that a child lived with fewer than two parental figures; in 2000, it made a huge difference. Children of the college graduates (the top line) largely avoided the single-parent crisis. Importantly, the connection between higher education and the good things in life is not, as some contend (famously Herrnstein and Murray in The Bell Curve), simply because smart people go further in school and smart people do well in life. Research shows that being in school longer – whatever is happening in and around the classroom – improves young people’s chances of doing well in most areas of life. Moreover, it is the marginal students, the ones who barely get into college, who benefit most from a college education. Even is more happening along the education gap: Increasingly, college graduates marry college graduates and live among college graduates. Increasingly, Americans group by education and their ways of life diverge by education. Although the trends are complex (see here), Americans today are likelier to marry people of the same educational level as themselves than was true decades ago. Some of this development results from educated men increasingly marrying educated women; for example, the lawyer who married his secretary is now a lawyer who marries another lawyer. And some of this change is due to poorly-educated men becoming ineligible as spouses; drop-outs can no longer support families on brawn alone. Then there is residential separation: A study by Thurston Domina (pdf) shows that college graduates are concentrating in some metropolitan areas (San Francisco and Raleigh-Durham, for example) and seem to be avoiding others (Indianapolis and Las Vegas, for example) and also that neighborhood segregation by college education grew substantially between 1970 and 2000. It grew faster than segregation by income, even as segregation by race declined. Another study documents how the highly-educated are concentrating in the downtowns of the most booming cities. And a recent story reported that these degree-holders are starting to raise their children in center cities — even in Manhattan. Thus, enclaves of the highly-educated are growing in chic, gentrified, non-smoking neighborhoods, while the less educated move to the scraggly, sprawling suburbs of stagnating cities. 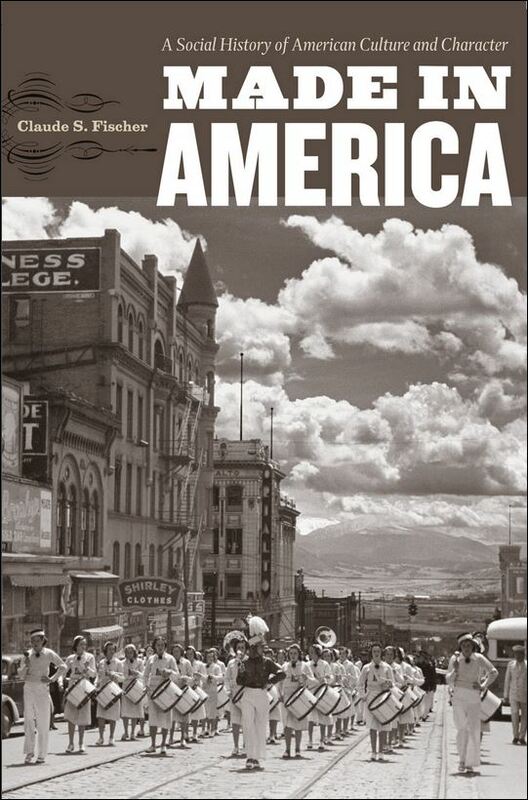 What is less clear, although certainly plausible, is that this widening separation carries along with its economic and social divisions, a widening gap in values and ways of life: two different Americas, divided educational attainment. Further expanding the proportion of our college-educated would do much – for the college-educated, for the national economy, and perhaps to shrink the education-wealth-culture gap. In financial terms alone, a $1 public investment in higher education eventually yields about $3 to the state (see here). But that is over the long run. Where the funds to invest would come from right now is another matter. We are not in the economic climate of the ‘50s and ‘60s, nor in its political climate. Public higher education is shrinking. The education gap may well keep widening for quite a while.